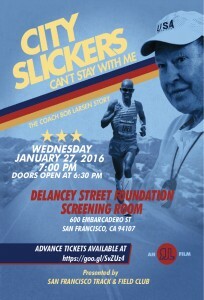 Just in time for the 2016 US Olympic Marathon Trials in February, San Francisco Track and Field Club is proud to bring City Slickers Can’t Stay With Me to running enthusiasts in San Francisco on Wednesday, January 27, 2016. The personal coach to the two-time Olympian Mebrahtom “Meb” Keflezighi, Coach Bob Larsen is hard at training and conditioning Meb to secure one of the three spots for the Olympic Marathon in Rio this summer. This touching tribute to Coach Larsen focuses his athlete-coach relationships and how his coaching style has had lasting impact on his athletes’ careers and personal lives. The story goes through Coach Larsen’s three phases: Earlier years when he coached at Monte Vista High School (1963 – 1967), Grossmont Community College (1967 – 1979) and Jamul Toads, then UCLA years (1979 – 2000), and the Mammoth Track Club years (2001 to present). A dozens of athletes and their supporters praise success of his coaching style. While some of the still photos and video footage from the early years are very fun to watch, the film also captures beautiful scenes from Meb’s training in Mammoth Lakes, CA. At the elite level, there are different styles of coaching: From the win-at-all-cost type on one extreme to more nurturing and trusting type on the other extreme. Coach Larsen’s is definitely at the nurturing/trusting end of the scale, and it has proven that his style can produce top results at the international level. I recommend all the running coaches and athletes out there to watch the film and celebrate Coach Bob Larsen’s achievements.